George created this website to be an online guide for tourists vacationing in the Cayman Islands. He was born and raised in Cayman, meaning that this website is kept up-to-date with the most accurate local knowledge available. 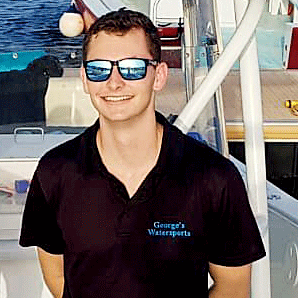 He also founded a watersports company, giving him valuable experience in the Cayman tourism industry; this translates into reliable coverage of Cayman's best activities, described throughout this website. Below are details regarding the best spa in the Cayman Islands. We have hand-picked this spa because of their amazing location on the world famous Seven Mile Beach in Grand Cayman. They accommodate tourists vacationing in Grand Cayman. There is an availability form below which when completed, sends directly to the spa; they will then respond within 24-hours. Reservations are required to make visit. Receive a relaxing massage on the world famous Seven Mile Beach. Relax as you gaze upon the crystal blue sea just yards away. A mixture of gentle stretching, deep tissue massage and warm Thai herbal poultices offer care, comfort and relaxation. A complimentary combination of deep tissue massage, Swedish, hot stones, aromatherapy and reflexology. A relaxing facial to boost dehydrated, dull skin, with the power of oxygen, rich vitamins and healthy antioxidants. Our hand-picked spa always responds within 24-hours; if you submit the below availability form and you don’t receive a response from them within 24-hours, you most likely made a mistake and it didn’t send.